Sep. 17, 2009 · 11:00 a.m. The brain-child of Ypsilanti resident Georgie Pachella, Talk of the Neighborhood is a play on the name of National Public Radio’s daily program Talk of the Nation. Pachella said similar to the radio show, there will be experts in the field presenting on a variety of different topics almost every Monday and Wednesday beginning next Monday. Topics in September are multi-cultural cuisine, antique and collectible appraisals, pet health and nutrition and differences in the male and female brain. Monday’s multi-cultural cuisine topic features Saul Davis, the manager of J. Neil’s Mongolian Grille. Steve Gross, formally the owner of Depot Town's Depot Exchange Antiques and owner and lead auctioneer of Ypsilanti’s Premier Auction Services, will lead next Wednesday’s topic on antique and collectible appraisals. “Steve Gross he is a big personality and he is a lot of fun to watch so even if you aren’t bringing in a collectible to appraise it’s an interesting show,” Pachella said. So far Pachella has programs scheduled through the end of October and future programs in the works for November and December. “One I definitely want to highlight is far away, but I would like it on everyone’s calendar, is on December 21 the Detroit Opera Theater is coming to our community center to do a special holiday show just for us,” she said. Pachella said the idea for Talk of the Neighborhood was sparked in an effort to bring some “longevity” to the building at 1015 N. Congress St. She said the average age of those who use the center is 80 and in the past 15 years the community center has been labeled as more of a senior center. 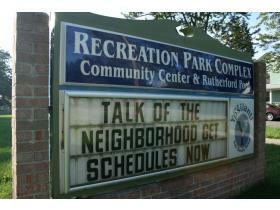 Ideas for topics for Talk of the Neighborhood were generated from approximately 2,500 surveys offered at the community center as well as distributed to houses between the borders of Hewitt Rd. and Huron Street and Washtenaw Avenue and Michigan Avenue. Based on the response, residents showed support for programming showcasing non-profit organizations, music nights, gallery nights, eco-friendly living and do-it-yourself projects among other things. The $5 cover charge goes directly to programming according to Pachella. She said cost of materials for most of the classes as well as the cost of printing schedules contributes to the cost of general programming. Although a schedule of topics for September and October were delivered door-to-door, Pachella said that wouldn’t be a common practice. She said from now on the schedules (for the following month) would be available on the first of each month. “You can get the schedule on the Web site, in the box in the front of the community center or at various businesses,” she said. Twenty-five businesses including Bombadill’s, Sidetrack Bar and Grill, Simply deVine and the library will have copies available. Pachella said it’s the volunteers offering to participate leading a program and lending a helping hand with distribution that have made the program successful before it has even started. But she said she is always looking for volunteers to continue to help spread the word - whether it be through helping with distribution, working a night of programming or just word of mouth. For a complete schedule and more information about the program and upcoming topics visit visit Talk of the Neighborhood online.